In the third of his occasional articles, we visit a place not so far afield - Germany in mid-winter. Most of my travels in marine surveying have taken place in warm climates – mainly on ships in ports located in Africa, the Middle East, Asia and Central America. 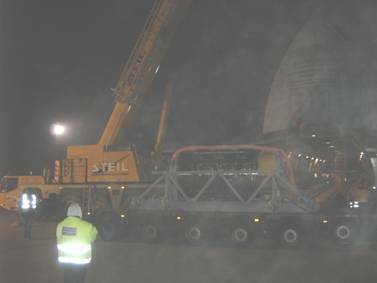 So it made a change to get an instruction to get to the depths of Germany, Saarbrücken in the Saarland (southwest of Frankfurt) in mid-winter, to attend the loading of a large piece of offshore oilfield equipment on to an aircraft which would then proceed to Singapore. 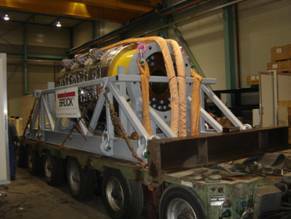 The piece of equipment in question had been manufactured in Saarbrücken for installation in an offshore oilfield development. The flight from Germany to Singapore was insured by London underwriters who had appointed us to check out and approve (or otherwise) the carriage logistics and hence safe delivery of the unit. I had drawn the short straw to attend the loadout in Germany, while our technical folks cheered me on from a warm remote office. The cargo which was so urgently required on site at the offshore oilfield that this aircraft could be exclusively chartered for the trip, was what they call a ‘Swivel Head’, a piece of precision engineering weighing just over 50 tonnes, which would be fitted inside the turret mooring system of a Floating Production Storage and Offloading (FPSO) installation. An FPSO is usually based on a converted oil tanker hull, fitted with processing equipment for separation and treatment of crude oil, water and gases, arriving on board from sub-sea oil wells via flexible pipelines. The turret is moored to the seabed with chains, wires and anchors and has a bearing (the swivel head) which allows 360° rotation of the FPSO around the turret, to the prevailing wind, sea and swell conditions. 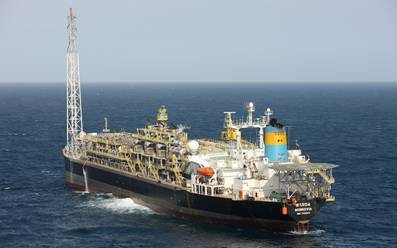 The FPSO has storage capacity and is equipped with an offloading system to transfer the crude oil to shuttle tankers for shipment to refineries. “Raroa”, FPSO based in the Maari Field, New Zealand, where the swivel head was ultimately bound. The insured value of this particular piece of kit was about US$2.5M, so its safe transportation from the manufacturer had to be organised in minute detail by the appointed freight forwarders. I was there as the London insurance warranty surveyor, meaning I had to approve and sign off each of three legs: at the manufacturer’s premises, loading and securing onto a truck and trailer; transporting the unit safely to the airfield; and loading to and securing on the aircraft. 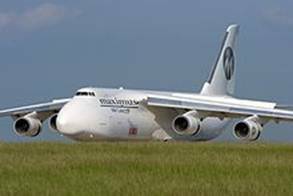 Everything being in place on the airfield, we now had to await the arrival of the Antonov, the estimated time of that being 8:00 pm. The sun set at about 4:40 and it got rapidly darker and colder. And colder. Since the aircraft was flying in from Ukraine, I was prepared for a lengthy delay beyond its ETA; so it was a pleasant surprise, insofar as that could be registered through the general numbness, when landing lights appeared beyond the horizon pretty well smack on time. With a thunderous roar, the huge plane was on the ground and taxiing in by about twenty past the hour. The next step was to load the swivel head and its cradle on board. Now here’s a thing. In over forty years of seafaring and then surveying, I’d loaded and secured cargo on many ships, but I’d never had to go through the exercise with an aircraft. Thinking about it, I supposed that a huge cargo plane would hardly be manoeuvring like a fighter, and the largest accelerations would, or should, be on takeoff and landing – but there could always be atmospheric turbulence en route. In fact, ships in severely adverse weather conditions would probably experience greater accelerations in terms of pitching and rolling, for which their cargo has to be adequately lashed down and secured. It’s one thing to figure this all to yourself, and another to confidently sign off the securing of a piece of kit valued at two and a half million dollars. So I thought I’d leave this to our technical people, who spent their sad lives number crunching. Guess what – they’d never worked out the securing requirements on an aircraft either, so there was a certain sucking of teeth. In the end, they calculated the securing (number and size of chains, hooks, shackles, rigging screws and so on) as though the swivel head was going to be loaded and lashed down on a ship, and then multiplied the number of chains by three, which seemed a nice round number if not exactly scientifically come by. It certainly afforded a good margin of error, and probably meant that under unforeseen stress, the aircraft would fall apart before the cargo was dislodged. 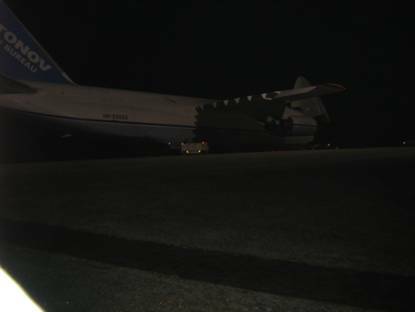 Certainly, when I got to talk with the Ukrainian Antonov crew, and told them what was required by way of the quantity of securing chains, they looked at me as though I was completely mad. I don’t think they’d ever been asked to go to these lengths before. I gave up on getting the phrase “belt and braces” through, too. The professionalism of the crew, under the command of a load master and flight manager, was most impressive. First, the nose cone was raised up to the open position, then the forward landing gear of the plane was hydraulically shortened so that the loading access sank to within a couple of metres from the ground. A sloping loading ramp with fixed rails was then run out in sections and locked in place, down which a flat steel skid was electrically winched from the cargo hold interior. All the certification for this equipment had to be inspected and approved, as the ramp and skid would have to bear the weight of the 50-tonne cargo. 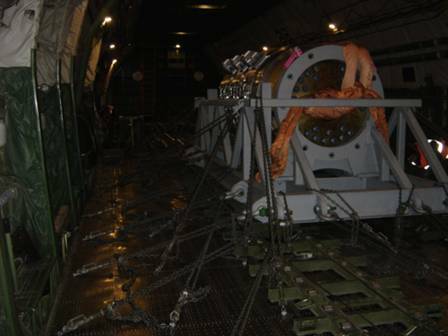 When this was completed, the mobile crane moved into position and lifted the swivel head from the trailer on to the skid, which was then winched back into the aircraft’s cargo hold to a position calculated by the load master to suit the plane’s stability and trim. 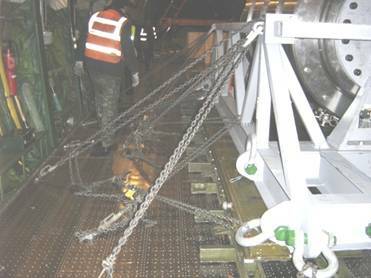 Once in place, the crew started the securing process, in which the size, angle and placement of each chain had, in theory, been calculated by our technical people. In truth, there were so many chains involved that it was impossible to achieve the theoretical plan – there were simply insufficient fixing points, so a compromise had to be reached, with chains being placed and tensioned wherever possible. Lashing and securing of the swivel and its cradle comprised a total of 60 doubled chain lashings of 7 mm diameter affixed to 25 mm diameter patent rigging screws hooked onto ‘D’ rings secured to female connectors set in the aircraft deck. The chains were set through the padeye lashing points on the swivel cradle or other strong points such as the cradle chassis transverse or longitudinal girders. The chains were tensioned by means of the patent rigging screws. This arrangement gave at minimum an approximate 150 tonnes restraint transversely, 150 tonnes longitudinally, and 150 tonnes vertically. The actual loadout and securing was completed remarkably quickly – by just after 2 a.m., so the operation from start to finish took less than six hours. The various certificates which I had to prepare and print out, and the necessary export paperwork - freight forwarders’ responsibility - took another couple of hours and then, in accordance with its flight plan, the Antonov taxied out and took off with an ear-busting roar, at 8:00 a.m., just before sunrise. As far as I was concerned, that was that, apart from the usual report writing – although I was relieved to be told a day or so later that the swivel head had arrived safely and without incident in Singapore. 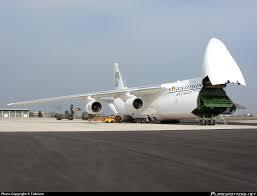 I would have hated to think that such a valuable piece of kit had got bent in transit. And the bonus was, I got home in time for Christmas.